Geoffrey Badger with students of Bermagui Public School. Photo: Chris Sheedy. A palpable sense of excitement is building around the inaugural Four Winds Youth Music Festival this Friday, Saturday, and Sunday (November, 16,17,18). 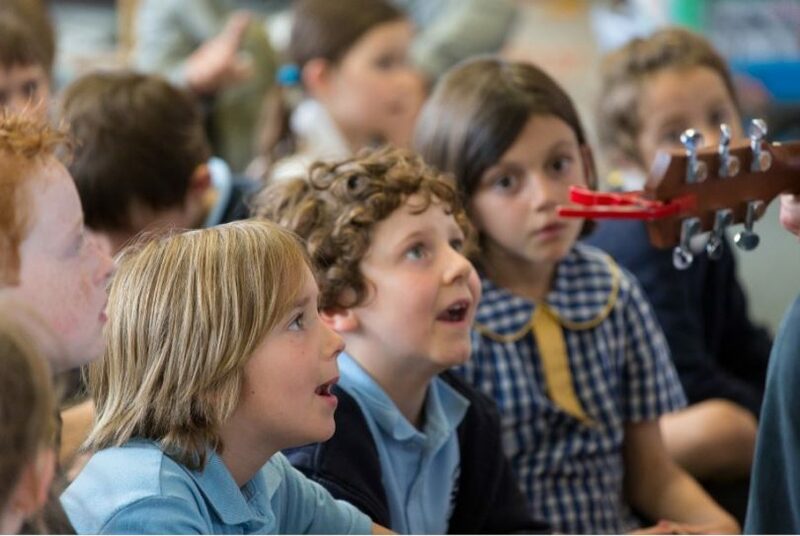 Schools from along the Eurobodalla and Bega Valley coast are in the final stages of preparation and rehearsal for performances shaped and crafted over months. Friday’s lunchtime concert in the Sound Shell at Four Winds will be a celebration of young people music making, with close to 1,000 voices coming together across a dynamic program including two pieces commissioned for the Festival – ‘From Bermi and Back’ by Lisa Young and ‘Mother Mountain’ written by Deborah Cheetham and local Yuin children. Schools taking part are Bermagui, Narooma, Tanja, Tathra, and Tilba, who will be backed by The Australian Voices from Brisbane, Western Sydney Youth Orchestra, Short Black Opera and other special guest artists. 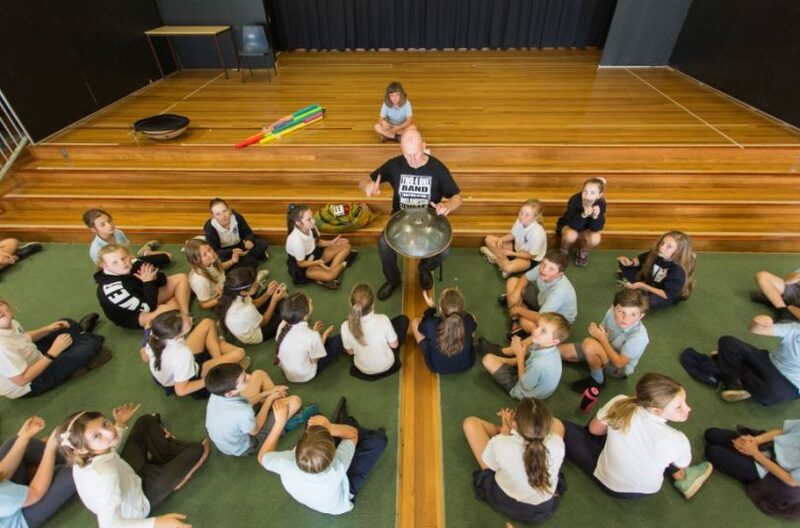 Well known Bega Valley choirmaster, Geoffrey Badger, and percussionist Greg Sheehan have been working with each school during terms three and four, however, this Friday’s concert will be the first time all the students have performed together. Close to 1,000 voices will come together for this Friday’s school showcase. Photo: Chris Sheedy. Aside from the massed choir of young voices, a body percussion piece featuring 3oo performers will be a highlight. “At times it will be the full company, an amazing spectacle, at other times it will be individual schools, a fabulous climax to their hard work and dedication,” says David Francis, Executive Director, Four Winds. David says the recent death of music educator Richard Gill will inspire many over the three-day festival. 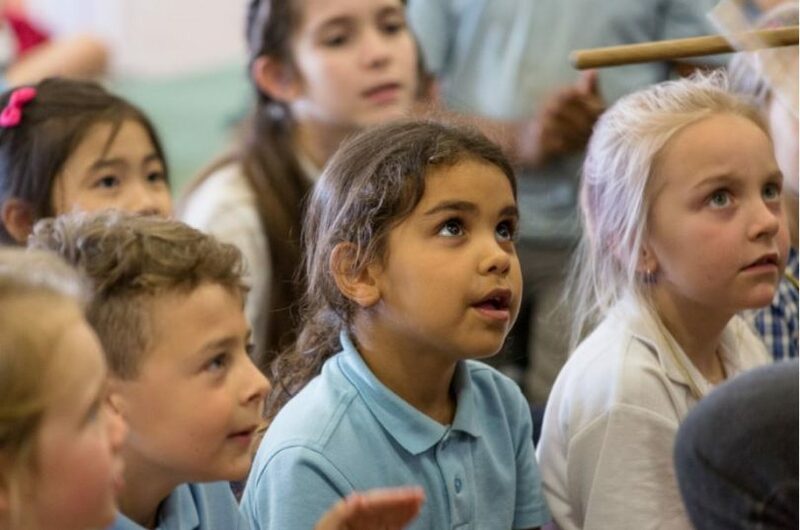 “This event is the embodiment of everything Richard advocated for – great quality music making in schools, leading to live performance opportunities including new music, to inspire a life-long passion for music making,” he says. “The event has also engaged many non-music specialist teachers through the National Music Teacher Mentoring Program which Richard founded. 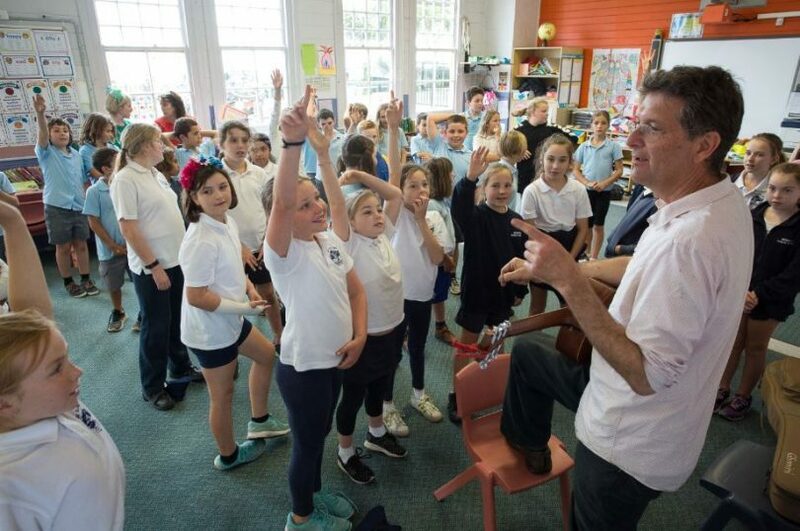 Greg Sheehan in rehearsals with Bermagui Public School. Photo: Chris Sheedy. While the community is invited to concerts on Friday and Sunday, Saturday’s program features workshops and mentoring for young local performers. “Sunday’s Youth Music Festival Concert is a showcase of exceptional talent,” David says. “Young people from across the region are coming together to perform as soloists, in small groups formed for this Festival and as part of our guest orchestra and choir. *Friday, November 16, 12 pm to 2 pm, the Schools Showcase Performance Concert in the Four Winds Sound Shell at Barragga Bay. Entry is by a voluntary donation of $10 at the door, 16yrs and under free. Friday’s concert features; Bermagui, Narooma, Tanja, Tathra, and Tilba primary schools, along with The Australian Voices, and Western Sydney Youth Orchestra. *Sunday, November 18, 11 am to 2 pm, the Youth Music Festival Concert in the Four Winds Sound Shell and Windsong Pavilion at Barraga Bay. Tickets are $30 (online or at the door), 16yrs and under free. Sunday features high school and primary school children including; The Arco String Quintet (Jarrah Catlin, Isabella Lightly, Miller Northam, Luca Ziino, Nyah Cockle), Hunter Bailey-Watts (piano), Bega Valley Youth Choir, Imogen Bichard (double bass), Ana Browne (vocals), Candelo Primary School, Mora Fiedler (piano/vocals), Juliet Fitzmaurice (vocals and guitar), Zosha Fitzmaurice (vocals), Emma Hunt (violin), Jasper Lay (guitar), Ruby Newell (taiko), and Amelie Ziino (voice and violin). Sunday’s program also boasts the Western Sydney Youth Orchestra, and you will experience the world premiere of another festival commission, ‘On the Track’ by Lisa Young which will be performed in its entirety by The Australian Voices and Bega Valley Youth Choir. On-site food vendors will add to the local ‘flavour’. David Francis says the ambition is to make the Youth Music Festival an annual event. “We want our young people to have the chance to experience the joy and buzz of performing in massed ensembles on a regular basis,” he says. “For them to be inspired by their peers and other young players performing. The inaugural Four Winds Youth Music Festival runs Friday to Sunday. Photo: Chris Sheedy. For tickets and more information head to the Four Winds website.